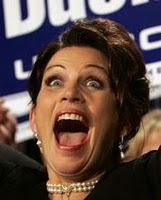 Michele Bachmann to debate a high schooler? We live in an age where potential Republican candidates for the presidency can apparently be bested by high schoolers. If you thought Sarah Palin's deer in the headlights response to Katie Couric's questioning was a new low in national politics, and the fitness of GOP candidates, wait until you hear this. Amy Myers, a 15 year old high school sophomore from Cherry Valley, New Jersey has challenged Minnesota Representative Michele Bachmann to a public debate on the constitution, U.S. history, and civics. Myers says that Bachmann's frequent factual errors, bald misstatements and total distortions aren't just bad for civic discourse - they're bad for women and the nation. Though I am not in your home district, or even your home state, you are a United States Representative of some prominence who is subject to national media coverage. News outlets and websites across this country profile your causes and viewpoints on a regular basis. As one of a handful of women in Congress, you hold a distinct privilege and responsibility to better represent your gender nationally. The statements you make help to serve an injustice to not only the position of Congresswoman, but women everywhere. Though politically expedient, incorrect comments cast a shadow on your person and by unfortunate proxy, both your supporters and detractors alike often generalize this shadow to women as a whole. So far no one has been able to ascertain whether Meyers is an actual student or simply an adult making a statement about the debased level of discourse that passes for politics in some conservative circles nowadays. Time will twill. Either way the larger point is all too relevant. Bachman's gambit, if indeed it is one, seems to be to deliberately dumb down her campaign positions to appeal to the prejudices of her less than enlightened supporters, which would imply she's a con artist - or she truly is in fact ruinously stupid and every inch the ignoramus her remarks make her out to be. Time will tell here too.